Faculty provide students with instructions for the written exam. The European Union of Medical Specialists (UEMS), as the European representation of medical specialists, encourages the use of a European board examination in neurology. The exam aims to test knowledge, problem-solving, presentation abilities, and handling knowledge and aspects of ethics and public health. These European board examinations are developing well and are replacing national examinations in several disciplines and countries. 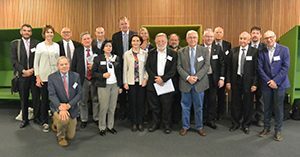 The European Board of Neurology (EBN) held its Eighth European Board Examination jointly with the European Academy of Neurology (EAN) in Copenhagen, Denmark. 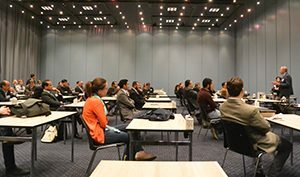 The UEMS/EBN/EAN board exam in neurology took place May 27, 2016, at the EAN Congress. 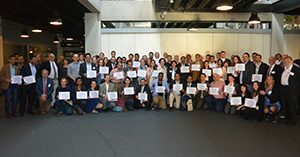 Seventy-two candidates from several European and non-European countries participated. The exam comprised multiple-choice questions (MCQs) in open- and closed-book fashion and was followed by a presentation of a short essay on a neurology, public health, or ethics topic and a critical appraisal of a neurological topic (CAT). The language of the examination was English. The faculty for the board examination in neurology gathers for the UEMS/EBN/EAN board exam. Although the largest part of the examination was the MCQs (80 percent), the oral interviews for the short essays and CAT allowed more personal contact with the candidates. The examiners took great care to listen, evaluate, and appraise the short essays and critical appraisals (right). These exam items were prepared in advance, and interesting topics relating to current problems, therapies, and procedures in neurology were discussed. 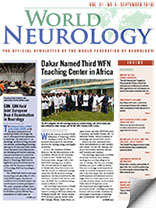 Teaching materials, such as ebrain, EFNS/EAN guidelines, and textbooks were suggested for preparation. The examiners and faculty were involved in the prior preparation of the presentations. As they were from many regions of Europe and North Africa, several authentic languages were represented, to help in addressing communication issues during the presentation. The successful candidates and faculty join together for a final photo after the examination. The number of participants is steadily increasing, and also the number of non-European candidates is rising, which makes the UEMS/EAN board examination an attractive examination. The next UEMS/EAN board examination will be in June 2017 during the EAN meeting in Amsterdam. The date is not fixed, but visit the UEMS/EBN website for technical details and announcements. The WFN was invited to observe, and, as WFN secretary general, I took the opportunity to observe and make this report.